Cyanuric acid and Melamine are very difficult to retain and separate in reversed phase column because the polarity is very high. However, if you use a column for HILIC like InertSustain Amide, there is no problem and separation is fine. 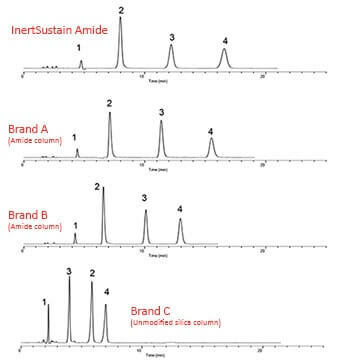 InertSustain Amide is strong, and it shows that it is good for separating polar compounds. Column: 5µm, 150 x 2.1 I.D.